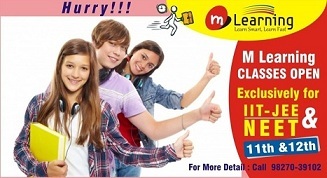 M Learning Classes is one and only model of coaching class which is hybridized with all the advantages of Machine Learning. High quality theory and conceptual lectures are delivered by IIT Guru Sundeep Gupta, other IITians and Doctors. Prompt repetition and revision of concepts is ensured through M Learning Video Lectures. Here we have limited number of students. Class 11th - 45 Students, Class 12th - 30 Students, Droppers - 25 Students. This ensures personal attention on each individual to achieve academic growth and psychological strength. Prompt doubt discussions and clarifications, Monitoring of syllabus coverage of each student makes the learning highly effective. Regular Examinations and Testing, Individual report and analysis, thereafter feedback and corrective action guarantees the success of student in targeted IIT JEE and NEET. The program is thoroughly synchronized with school curriculum. Its beautifully adaptive with students IQ and Speed. Motivation, Energy and Enthusiasm of students is maintained at high level. Dropper - May 01, 2019. March 24, 2019 and March 31, 2019.